Stefan Garlicki (Investec) won the first event in the 2016 Western Province Downhill series held at Helderberg trails on Sunday 14 February, in a time of 02:49.213. 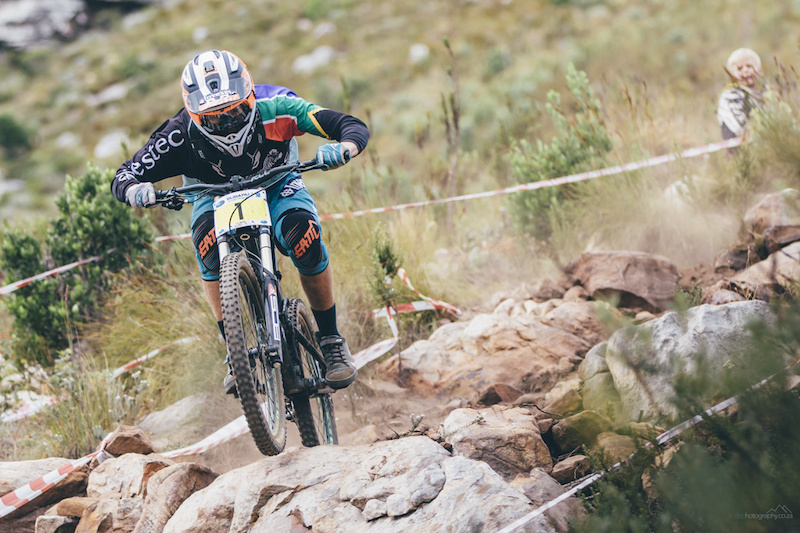 The 2015 South African National Downhill Mountain Bike Champion edged out Andrew Neethling (Polygon UR) 02:50.680 and Adi Van Der Merwe (Solid) 02:59.314 - the only two other riders to go under the three-minute mark. "I’m unbelievably happy to take the win for the first race of the year,” said the Paarl rider after the event. “To beat Needles (Andrew Neethling) is always tough!" "It’s been a long off-season, the last downhill race I did was in September 2015 in Leogang, Austria. In that time I’ve had an injury as well, so you never know quite where you are – you train and practice, until you race you can’t really tell – so it was really good to take the win" he said. "The track was amazing,” commented Garlicki who has raced on the best tracks in the world. "Helderberg Trails put together something amazing here. It was challenging and will up the level for sure." Conditions on the day were overcast early morning with clouds gathering around the Helderberg mountain peak. Midway through practice, the heavens opened and it rained pretty hard, for about half-an-hour. It had been hot and dry in the run-up to the event, so the moisture was very much welcome - changing the soil from the finest powdery dust, into more a tacky, grippier surface. This proved to be the top layer only, though so after a few runs, the dry soil below surfaced again. Some 60 riders were in attendance on the day with 49 completing their race runs and by all accounts the day was a huge success. "I would like to say thanks to our riders and their sponsors, because without them we will not have the honour of putting gravity races on the SA and WC mountain bike calendars," said organiser Riaan du Preez. "As WC Gravity I would like to thank the WC MTB Commission and Subaru Cape Town for making the first WC Downhill Cup event a reality. To all the helpers behind the scenes and the landowners giving us the privilege to host event, a very big thank you." The next event takes place on 28 Feb 2016, also at Helderberg (Its the SA MTB Cup Series DH). More info here. Looking forward to both the local and international DH season!